2. Thomas Eakins began to sketch this picture on the night of April 22, 1989, at the Athletic Club Arena on North Broad Street in Philadelphia, his native city. Years before, guided by the photographic principle of focusing on a primary area and then a secondary one, the latter bathed in shadows, he had painted the masterly lecture by two expert surgeons in different amphitheaters. 2.1 In Portrait of Dr. Samuel D. Gross (The Gross Clinic, 1875), Samuel D. Gross delivers a lecture on the treatment of a patient suffering from osteomyelitis of the femur, while a group of doctors illustrates that operation on the body of an anesthetized patient. Two doctors and a surgeon operate while the professor addresses his students. A fourth person, highlighted to the right of the operating table, with eyes cast down at a sheaf of papers, is Eakins himself, who the artist portrays in the act of sketching the scene. A family member of the patient, next to Dr. Gross, covers her horrified face, and beyond the right shoulder of the doctor, the hospital secretary takes notes on the proceedings. Eakins seems to have a dual purpose in this painting: to portray the undaunted greatness of a doctor and to provide an accurate rendering of the process through the good offices of a scribe. 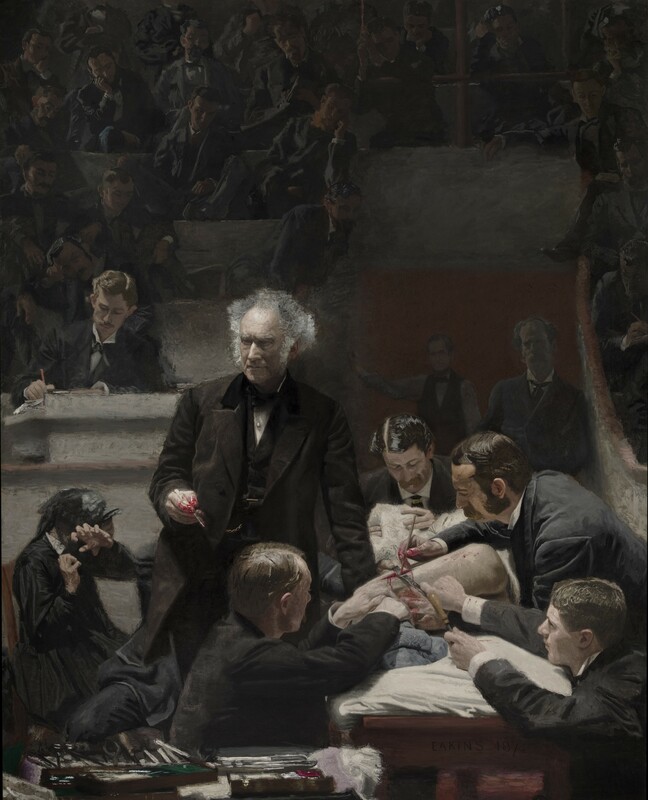 2.2 In The Clinic of Dr. Agnew (The Agnew Clinic, 1889) Eakins reworks the theme of the lecturing doctor in relationship to his audience. This time, the focus is even more contrasting: Dr. David Hayes Agnew, in a forum of the School of Medicine at the University of Pennsylvania, demonstrates how to operate on a person suffering from cancer of the chest, while an anesthesiologist, a doctor, and a surgeon perform that operation on the patient’s body. In the background, in a semicircular seating area, the students are witnesses to the scene. Here Eakins’ iconographic reference point is much more eloquent: Rembrandt’s The Anatomy Lesson of Dr. Nicolaes Tulp (1632), where the play of shadow and light accentuates the dichotomies that underlie the scene: the modernizing appeal of the positive science versus the desecration of bodies; consequently, life and death; individuality and the crowd; the restricted field of a modern initiation rite and the parody of scientific exposure serving as the only possible condition of modernization. A supreme parody insofar as knowledge—synonymous with light—is produced in closed precincts characterized by a form of artificial illumination, in constant friction with the shadows. In the seating area of the amphitheater, diluted in the mass, a student takes notes. 2.3 To one side, in the role of witness, the scribe sanctions the facts. He establishes divisions, hierarchies, and relationships of power within his constituent elements (Drs. Gross and Agnew occupy important areas in both pictures, which contrast with the secondary and somewhat anonymous and gloomy role of the students who witness the evolution of History—an evolution otherwise static or rhetorical). The painter, through his double disguise as scribe and chronicler, emerges as an eyewitness to the event, allowing reality to produce its trick and to operate—without altering, deforming, or disturbing the facts—according to the natural logic that sets contraries in opposition. 3. In Between Rounds (1898–99), the scribe who had assumed the role of witness in earlier paintings is now of the utmost importance. This figure aids in organizing the perspective and diminishing significance of what happens above the ring—namely, to negate the anecdotal value of the picture itself. Despite having such an important function within the semantic organization of the painting—and with the operating room transformed now into a boxing ring—the Chronicler takes no part in the arena of events. In one corner a “second” is depicted fanning the boxer’s face with a towel. He is as graceful as a ballerina by Degas, and the effect produced seems to accentuate the sculptural origin of the modeling in paint. By contrast, the trainer appears agitated and, more than just prescribing a strategy for the next assault, he appears to ask his fighter whether he’s even in shape to carry on. Everything indicates that the fight won’t last very long. Even though barely two rounds have passed, as indicated on the Press’s balcony banister, the boxer may have suffered a premature beating. We know nothing about his opponent or about his condition, and this is significant: by removing the opponent from our vision, Eakins allows us to discern the plot of a hidden failure, which unlike victory, requires no one else for corroboration. (By contrast, David needed Goliath’s severed head to negotiate his victory with the leaders and share it with the people, exalting himself.) However, defeat is something much more bitter that requires the half-light of soliloquy to legitimize it to oneself. 4. A strong exchange of punches has left the boxer exhausted. Seated in his corner, demolished so to speak, he clings to the ropes, separating his arms at right angles so as to enlarge the thorax and allow more air into his lungs. Eakins, at a subliminal level, is likely playing with the parodic representation of a crucifixion, given that the boxer is barely covered with white boxer shorts—his gloves and boots concealing the hypothetical points where nails would have sunk into the cross. Or maybe Eakins only wanted to contrast the nakedness of this figure with the hostile attire worn by the other actors in this theater of shadows. Civility and brutality? Perhaps also modernity and decline versus the archaic vices of a society incapable of forgetting its origin rituals. 5. One axis for understanding this picture cuts across photographic faithfulness to a reality on display for the eyes of the painter. The other is an undisclosed narrative, a story we can surmise or even imagine, but that remains unavailable for a painter to develop by means of his art. Strictly speaking, the picture ends where the story begins. We cannot apprehend the painting as anything but a series of reliefs and details generated from within the work, thanks in part to the way in which the light of the burning lamps happens on the volumes of the bodies, creating an almost vulgar sensation of space through brightness or as an effect to render the patina of the time. We are not exempted from the drama represented in this painting. In excess of its material qualities, those perceived only through intervention of touch, the scene comes to life. It’s as if the imaginary circular line of this coliseum involved us in a concrete, transcendent, architectural space if only to transfix us into looking at what will happen. Hence, in this reflection on the spacial-temporal dimensions of spectacle, Eakins clearly establishes three categories of viewers: the first is composed of the public that packed the aisles of the Athletic Club Arena on North Broad Street on the night of April 22, 1898; the second, missing from the picture but available in the effect that the solitary figures of the Officer and Chronicler produce, is the actual view of the painter. A third category comprises all of us as viewers and witnesses outside of time, located in a hypothetical far side of the painting. 6. This series of entelechies calls to mind a viewer of viewers, a supreme spectator who knows in advance the outcome of the story and for whom depiction of the totality is a futile business. In the same way, Eakins believes that simultaneity isn’t found in the representation of a totality, but in the concentration of partial facts, where selections gather harmoniously in the retinal space of the canvas. Between Rounds amounts to a side punch dealt across the deceptive volume of an instant, in the photographic pause that precedes the fiction of movement. 7. The words arena and coliseum point to a monumental Roman past, where the despair of the multitudes found a form of relaxation in watching body fighting with an armored glove or cestus; pankration was an escape valve from the demands and pressures exercised within the social body and upwards against the estate of the higher ranks. 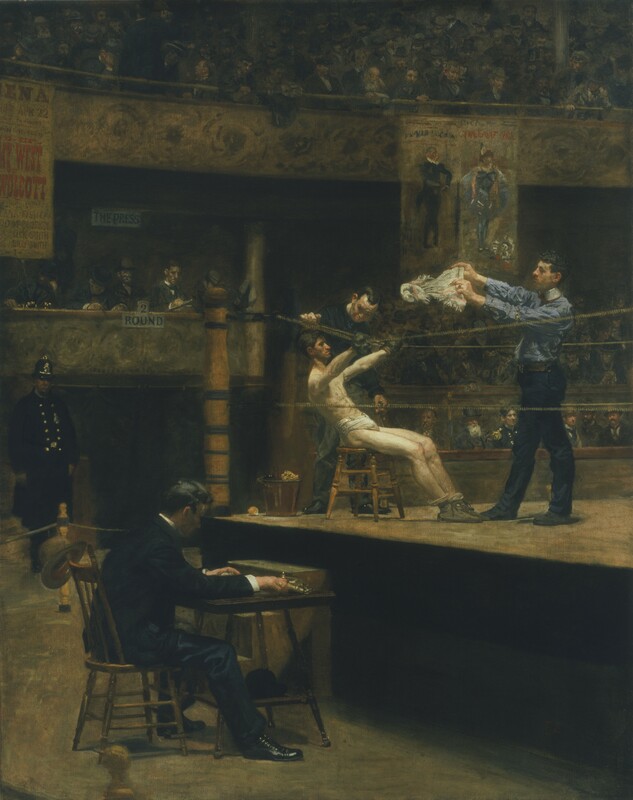 However, as depicted by Eakins, the modern world of boxing descends to the closed spaces of the catacombs, the congested air of the subterranean where those same passions are seen altered by the arrival of a new ingredient: professionalization. With the professionalization of a sport like boxing came investors, promoters, and bribery. Blood, death, and duration were no longer the center of attention for the masses and in their stead came the reign of technique. The spectrum polarized, and humanization of the heroes gave way to a logic of the defeated. 7.1 Since the seventeenth century, when the practice of boxing was revived in the English colonies of North America and the first regulations began to appear, fans began to raise the suspicion that the best fighter doesn’t always win. The poison of bribery began to compel the figure of certain boxers, who not only earned easy money by agreeing to defeat, but who also contributed with their apparent lack of scruples to balancing the necessary weights and measures toward a performance that depended on one hundred percent charisma. A moderately good boxer needed a fencer’s talents to cement the credibility of his victories. A champion in decline required an adequate sparring partner to increase his career rewards. Bribable fighters became domestic figures in the gyms: they could dazzle with their technique when training only to bamboozle later in the ring. “He’s very good, maybe too good . . . ” can be overheard in the drudgery of the locker rooms, inhabited by the initiated. More than a footstep in the halls of glory, talent can be a damning trait. 7.2 In a world governed by high-profile icons, what captures the imagination of writers and artists is not the undefeated fighter so much as failure. It isn’t difficult to find an answer for this preference: the heroes that gain the admiration of our era feed on an unpaid humiliation. For the rest, the life of the athlete is subject to the reign of time. The sports hero that makes the tabloid headlines today will know obscurity tomorrow. The brevity of youth is relentless, and this delegates the life of athletes in general, and of the boxer in particular, to a ruthlessly short duration. 7.3 As opposed to the transitory, which can be judged from a moral and therefore mistaken point of view, Eakins’ painting is rather a reflection on the eternity of an instant the painter’s eye captures with the same probity as a lens in the emergent art of photography. 8. In a story about boxers (“The Killers”), Hemingway imagines two hitmen who are introduced at an open-air restaurant with the vague purpose of ambushing a boxer who has broken his word. They gag the cook and waiter and point a gun at the restaurant clerk. After hours of fruitless waiting, the killers leave. The waiter, freed from his mouth gag, decides to advise the boxer, who is staying at a hostel not far from the restaurant. He finds him dressed in a suit, vest, and tie, resting on the bed in his room. He spends the entire day lying down, waiting. There’s nothing that he can do to influence his destiny, and the boxer knows this better than anyone. That’s where the story ends. It isn’t the best of Hemingway. However, the story offers us an eloquent image of a fight resolved before the fact. Every form of combat, in fact, appears to be resolved beforehand. An elusive force, which has hovered beyond our point of reference, is responsible for capriciously tipping the balance on the side of shadows and the night. 9. The boxer, together with the butcher and the pickpocket, appears to be one of the most genuine products of the modern city and its decadent putrid entrails. The boxer is born and raised in some of the most sordid neighborhoods of a city; he trains in musty hideouts, to arrive by night at those howling hovels where fights are arranged. The locker rooms smell of rust and saliva, aging for decades. The clothes and dressings, as well as the grease spread over the boxer’s body to dodge the impact of an opponent’s glove, increase the sensation of frigid sweat and unease as the fighter’s muscles stiffen before climbing into the ring. But Eakins isn’t interested in painting the nervous tension that precedes the fight. His interest has to do with an accurate sociology and history. 9.1 In The Gross Clinic, the surgeons wear a suit and tie; whereas in The Agnew Clinic surgeon, anesthesiologist, and medical assistant are all dressed in white, as prescribed by new aseptic practices that in those years had entered into force. In Between Rounds, the fighter wears white shorts as the only garment covering his body; it was decades later that boxers began to wear longer shorts and protective gear and mouth guards. Also, the figure’s gloves are smaller and less cushioned than those used today, and his boots are only thick enough as to keep from skidding on a ring covered in spilled sweat and blood. A police officer guards the scene. Two vaudeville posters that hang from above on the edge of the platform remind us of the eminently theatrical nature of this scene. Eakins prefers the hues of grease and oil and the resulting glimmer on a body so as to represent that maelstrom of shadows, illuminated in an interior akin to an amphitheater where passions tremble. In the platform the bets and the speculations circulate, and it isn’t fate exactly that intervenes in the rules of this performance. It’s the man Eakins has sought to enthrone on his bench, overwhelmed, with the same uncertainty that excites the platform. In Between Rounds, Eakins puts this same procedure to the test, no longer on the linear but on the transversal: the fruit of the social body opens to expose its entrails. The interior Eakins depicts is a sacred interior, where flesh is the exact equivalent of spirit. The dominant palette in this painting (beiges and maroons in contrast to blues and grays) is a faithful reflection of this choice to make things embody, in the same sense that the spirit is embodied in a luxuriant figure of speech. Completely foreign to Jünger’s Germanic spirit, Eakins refrains from elaborating a “metaphysics of suffering,” and keeps to that sacred aspect, tense in its relation to the profane and scientific aspect subsumed under the scalpel’s incision of a patient’s body in front of the shocked look of students huddled into a congregation on the platform of a university amphitheater. 12. In a time that runs parallel to the time of painting, Edward Hopper’s realism goes a point further from that of Eakins. Whereas Eakins depicts a boxer in his corner, coached by his trainer and indulged for a second, Hopper renders a seminude showgirl who strolls around the boxing ring, holding up a placard with the number of the next round. Eakins points to the solitude of the individual whereas Hopper shows the individual alone and in possession of all his misery. 13. Eakins paints the relation of the part to the whole. Without disavowal or termination. At most, he relativizes. In the positive world externalized by Whitman in his poems, he posits the body as the poetic reason of the whole. The social body in turmoil, subject to a panorama of passions that corrode or destroy. But man is only a man—that is, a body at once objective, visible, indivisible, and unique. This is the only reality that Eakins seems to grasp, dismissing the notion of art for art’s sake—an autonomous art therefore disassociated from the body, both individual and social. At every moment, Eakins appears to account for the presence of a public and the manner in which it might react to the quality of his painting. The world is that great comprehensive mirror, a forum where the eye of the painter can observe itself. 14. Chronicle of a Prospect Intervened could be the subtitle of this magisterial painting by Thomas Eakins, inasmuch as it portrays the interval between an episode and a boxing match, each akin to defeat. Gabriel Bernal Granados is one of Mexico’s foremost writers. His many books of essays, short stories, and aphorisms include Simulaciones (Simulations; Mexico City: Aldus, 2000); Partituras (Sheet Music; Xalapa, Mexico: Universidad Veracruzana, 2000); Murallas (Ramparts; Mexico City: Consejo Nacional para la Cultura y las Artes, 2015); and most recently Anotaciones para una teoría del fracaso (Notes Toward a Theory of Failure; Mexico City: Fondo de Cultura Económica, 2016). He is the recipient of awards from Mexico’s National Fund for Culture and the Arts, the Rockefeller Foundation, and the Mexican Center for Writers. He lives in Mexico City, where he is cofounder and publisher of the publishing house Libros Magenta. Roberto Tejada is the author of the poetry collections Full Foreground (Arizona, 2012), Exposition Park (Wesleyan, 2010), and Mirrors for Gold (Krupskaya, 2006), and translated into Spanish, Todo en el ahora (Libros Magenta, 2015). Founder and co-editor of the late multilingual journal Mandorla: New Writing from the Americas, and media historian, he has also published National Camera: Photography and Mexico’s Image Environment (Minnesota, 2009) and A Ver: Celia Alvarez Muñoz (Minnesota, 2009). He is faculty in the creative writing program and art history department at the University of Houston, where he is the Hugh Roy and Lillie Cranz Cullen distinguished professor.